As a digital library “Psepheda” offers, through its collections, a scarce printed and audiovisual material, which makes it one of the most appropriate means for the conservation of recent cultural and academic heritage. As institutional repository “Psepheda” fulfills the objective of concentration, digital preservation and promotion of both dissertations and theses elaborated by the students of the University of Macedonia and other publications issued by the University. “Psepheda” was created in 2006 and the first digital collections were developed under the project “PLOΕGIS: From information to knowledge” (3rd CSF / Operational Programme for Education and Initial Vocational Training ΙΙ / Action Line 2.1.3d), the period from 2005-2009. In the framework of the project “Open Access Scholarly e-Content at UOM: supporting library services for its organization, promotion, publication & interconnection” (NSRF 2007-2013, OP Digital Convergence, B2, MIS 304170), Psepheda restructured, enriched with new collections and new digital content and is offered in an upgraded software version according to international archival standards and import metadata (bibliographic information) of digital material. Psepheda is supported by the open source software «DSpace» (v.5.2), which has been created and developed by the Libraries of the US MIT and is compatible with international standards for Open Archiving and data mining (OAI compatible). It includes doctoral theses prepared by graduates of doctoral programs at the University of Macedonia. The dissertations are admitted in Psepheda after they have been successfully supported in front of an evaluation committee assigned by the corresponding University Department and only if they meet the scientific paper writing standards. This sub-community is divided into individual collections corresponding to the University’s Department of Studies. It belongs to the Sub-community Students’ research papers. Here you will find papers of postgraduate students of the University of Macedonia. This sub-community is divided into individual collections per Programme of Postgraduate Studies of the University. It belongs to the Sub-community Students’ research papers. It includes works prepared by researchers who hold PhD degrees in fields that fall within the research interests and / or disciplines of the Departments of the University and aim to develop innovative research themes. The sub-community is divided into individual collections per University Department of Studies. It belongs to the Sub-community Students’ research papers. It includes works prepared by graduate students of the University of Macedonia. These works are admitted in Psepheda after they have been successfully supported in front of an evaluation committee assigned by the corresponding University Department and only if they meet the scientific paper writing standards. This sub-community is divided into individual collections corresponding to the Graduate Studies Departments of the University of Macedonia. It belongs to the Sub-community Students’ research papers. It includes digital objects of works issued by the University of Macedonia in honor of the Teaching and Scientific Personnel (Faculty) of the University. Each Volume is a separate collection and is dedicated to a faculty member of the University of Macedonia. It belongs to the Sub-community University of Macedonia Publications. The collection includes several course guides and other guides of the University of Macedonia and the Industrial School of Thessaloniki. Therefore, it includes a series of UOM administrative yearbooks for the years 1965-1990. It belongs to the Sub-community University of Macedonia Publications. The collection includes digital items of deliverable works produced in the framework of R&D projects implemented under the supervision and / or the financing of the University of Macedonia Research Committee. The collection belongs to the Sub-community University of Macedonia Publications. Here you will find introductory reports submitted to the Greek Parliament for each Law proposal for the period 1974-1993. These reports are not digitally available on the Greek Parliament’s website. You must know the title of the law to identify a report, because it is not possible to search the collection by the number of each law. The digital files relating to introductory reports of laws are chronologically organized by Ministry. Each Ministry consists an individual collection in this Community. This collection includes digital objects of studies and monographs of economic & political science published during the period 1940-1974. 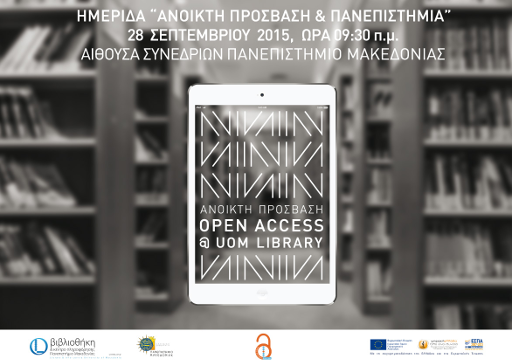 The collection aims at providing a digital library of Greek economic and political history. The subject areas covered are: Management, Finance, Economic and Political Science. The digital items belonging to this collection appear under Books. Here you will find sectoral studies on Greek business enterprises and Greek industry, published by private institutions and organizations and obtained by the Library & Information Center of the University of Macedonia by purchase. These studies provide valuable information for several sectors and sub-sectors of the Greek economy, such as: overview of sizes and ratios of sector assessment and analysis, industry strategic review, financial sector analysis, SWOT strategic analysis, benchmarking among the largest enterprises, companies profiles, etc. This collection is structured by publisher and then, by the issuing year of each study. It includes music scores in digital format, and digitized audio-visual material from recorded and filmed concerts, workshops, conferences and other related activities of the Department of Music Science and Art of the University of Macedonia. It includes textbooks, handbooks and other educational material which the Library has either obtained in electronic format from the publishers and has properly processed so that they can be used by print disabled students or has digitized upon request by print-disabled students of University of Macedonia. The items belonging to the collection appear under Textbooks. RSS Error: A feed could not be found at http://openaccess.gr/news_events/rss/news_atom.dot. A feed with an invalid mime type may fall victim to this error, or SimplePie was unable to auto-discover it.. Use force_feed() if you are certain this URL is a real feed.